In V.S. 1548 at the age of 13 years, Shri Mahaprabhuji arrived in mathura during his first global tour; he resided at Vishram Ghat on the bank of Yamuna river. At this time he form Shri Yamunastakam which describes Shri Yamunaji’s divine description in "Pruthvi Chhand". In Yamunastakam’s first eight shlokas, Shri Mahaprabhuji describes Shri Yamunaji’s eight fold powers, its divine & wonderful icon and her divine qualities. Shri Yamunaji is the daughter of divine Sun. Her purpose for coming to earth from heaven through Kalind mountain is to bless her devotees. Her physical state as a river is also very attractive and charming. She is so kind that she even blesses evil people ! Shri Yamunaji blesses her devotees with eight fold powers. Even if an evil person, drinks water from the river Yamuna to quench their thirst, She blesses that person. So, if we humbly pray to her with knowledge and understanding, we should not be surprised if she blessed us also. One of the example from Shri Mahaprabhuju’s 84 Vaishnavas, is of Kishoribai. Kishoribai was chanting only two lines from Yamunastakam with full faith. Shri Yamunaji blessed Kishoribai with all divine fruits. Suraa Sursu Poojitaha, Smara Pituh Shri yambibhrateem. Shri Yamunaji is capable of giving all kind of achievements. This first shloka describes the physical state of the river. Its both banks are full of glittering sand which is believed to be as soft as lotus feet of Shri Murari Prabhu (Shri Krshna.) Also, there are various kind of gardens of the both banks of the river. The river water is full of scent due to flowers of the garden on her banks. 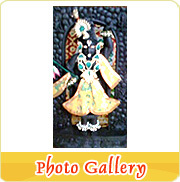 Shri Yamunaji is also worshipped by two kinds of vraj devotees. I bow to Shri Yamunaji described above, full love and devotion. She is capable of giving fulfillment of all the desires of the devotee in enjoying God’s love. Mukund Rati Vardhinee, Jayati Padma Bandhoho Suta. In this shloka, Shri Mahaprabhuji describes that how Shri Yamunaji can bless her devotees to increase their love towards Shri Mukund Prabhu. Also, Shri Mahaprabhuji describes the physical existence of Yamunaji as river. It flows enthusiastically from the top of Kalind mountain. The swirling waters appear to be as white as milk because of the force and flow of the river upstream. It seems like Shri Yamunaji is very eager to go in Vraj and meet Shri Krshna. It also gives impression as Shri Yamunaji is swinging in best kind of jhula. Victories to this most divine daughter of the Sun !! When Shri Yamunaji came to earth from the heavens, She blessed the whole globe by Her presence. All living beings, including birds such as parrots, peacocks and swans, serve Shri Yamunaji. Shri Mahaprabhuji visualize the glittering sand as her bangles of pearl and the waves upon the waters as beautiful divine hands of Shri Yamunaji, moving to and fro in a continuous manner. The meandering waters form beautiful banks on either side of the river, which look like the volupturous curves of a beautiful maiden. She is favorite fourth queen of Shri Krshna. And Shri Mahaprabhuji asks us to bow to her. In this shloka, Shri Mahaprabhuji describes the prayer to Shri Yamuna Maharani. O! Shri Yamunaji, you have infinite divine qualities. Even, Gods like Shiv and Brahama praise you. You have granted all the wishes of such great devotees as Dhruv and Parasher. Such holy cities as Mathura are on your banks. You are always with gopi’s and gopijans and you are always protected by blessings of Shri Krshna. O! Shri Yamunaji, I wish that you give me such a blessing that it gives peace and happiness to my mind. Chanting this shloka with pure and honest heart gives tremendous mental peace and eternal happiness. Shri Gangaji evolved from the lotus feet of Shri Bhagavan. Shri Gangaji became holy and pious due to merging with Shri Yamunaji at Triveni Sangam at Prayag (Allhabad), India. Shri Yamunaji made Shri Gangaji capable of giving all boons to her devotees. Amongst great goddesses, only Shri Laxmiji is equal and comparable to Shri Yamunaji in honor and power. I only wish that Shri Yamunaji, who can remove all worries of her devotees, and who is also the most favorite of Lord Shri Krshna, comes to stay in my heart and soul forever. O! Shri Yamunaji, I bow to you with my full body and heart. Your divine character is very wonderful. Just by drinking your water in Vraj, we do not have to worry about the pangs of death. Your devotees can become favorite of Shri Krshna just like the gopijanas who became His favorite by doing "Katyani Vrat" on your banks (Vrat = religious observance accompanied by fasting). O! Shri Yamunaji, who is the favorite of Shri Mukund Prabhu, I pray to you and respectfully request a divine body, fit enough for Shri Bhagvad Leela and also able to serve you. Only you are capable of granting such a boon. With such a divine body, I can serve Shri Mukund Prabhu very well. Pushti Margiya vaishnavas (Jivas) had never praised Shri Gangaji without your merging with Shri Gangaji. O Thous daughter of the sun, Thou art worthy of all praises! Indeed, singing thy praises and living near thee is more desirable than Moksha (nirvana / liberation of the soul). 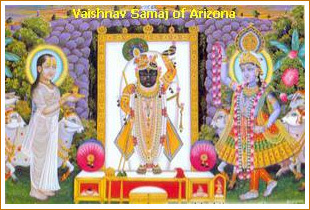 Indeed, your sacredness was enhanced when the gopies of Vraj, along with Shri Krshna, bathed in thy waters after the Rasa. The sweat of their divine sports mixed with thy waters, enhancing your holy powers for all time to come. Svabhavavijiyo bhavet, vadati Vallabhah Shrihareh.